Emotions combined with fear, that seems to be the driving force for politicians as well as managers nowadays…. Greece is the main problem, but suddenly a handful of refugees appear (in fact a number less than 1%! of the European population) and the issue of Greece appears to be solved. Completely out of the media. The Chinese growth figures have been adjusted from 7% to 6% and the stock exchange markets went down with approximately 15%. Have we forgotten how to think rationally since 2007-2008 ? Apparently we fear to lose everything we’ve got. Indeed we have always more and more. People complain and harp on but nevertheless we must admit that we’ve never possessed that much ever before. Of course we’re afraid that we’ll have to compromise. There is no need to if we’re all working and pay attention so that our incredible good social security won’t be abused. Obviously it must be controlled more severely. And leave this system for the benefit of those who really need it and expel from the exploiters…that’s work for the policy makers who are willing to think in the long term. It’s not to blame on the Vintage Volkswagen world or any other make of Classic cars. The market conditions are high and very promising in our niche market. If I look to the prices of old timers, even to me they seem incredible. For the price you could buy a nice Porsche Pre A 3 years ago, you’ve now hardly a 911 from the mid-eighties… for the same PreA you pay nowadays the triplicate. The prices for Volkswagens have been increasing for the past 15 years and investment capital finds its way more and more to our hobby. That’s a good thing, though it has some disadvantages… Good : because it enables many salesmen to attend a more important segment of cars (improvement of collection) bad : because many investors don’t show their cars, they just keep them stored for a period of 10 years. That is wrong. To buy a car is one thing, but during storage you should care for the car…preferably also drive with it. This leads us of course to ‘our” parts supply. The summer season 2015 was for our customers as well as for us a top season. Apparently we keep on growing, that’s a good thing, isn’t it? In the autumn we will be working at BBT for a better and faster service, better deliveries and a higher satisfaction degree for our customers. Our system isn’t impeccable, perhaps owing to growing pains, but we are working at it. With a “bullet proof” system, not as a fata morgana, but as an exclusive target. We’ll go for it! 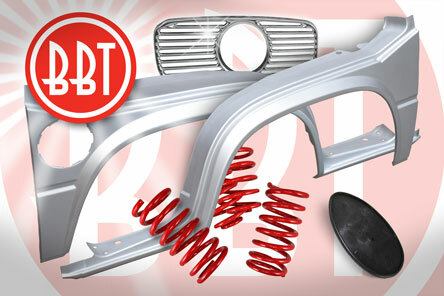 This newsletter is full of news of new products and information of our BBT product assortment. So during autumn you can undertake steps to start a big winter restoration project. A good start assures nice work. Order the parts you need in time to avoid stops during restoration. 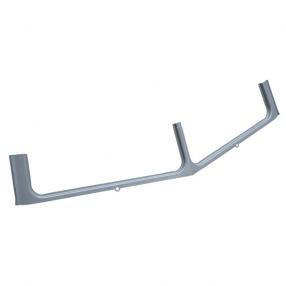 That’s how parts for Vintage Volkswagen make your personal conjuncture flourish. Isn’t it marvelous to collect cars ? Enjoy the beautiful colors of the autumn season. Driving with old timers during autumn is really worthwhile! Do you know that BBT has a weekly product update through the BBT blog ?Our FPU appears each Friday at 12pm and gives a short summary of new products, products that are back in stock again after a long period of discontinuity or eventual improvements and modifications in our product assortment. 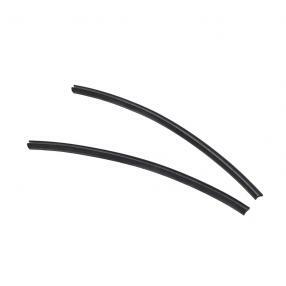 This rubber strip offers protection for the gap between the bumper bracket covers and the car body for Karmann Ghia from 08/55-07/71. (With round bumpers). In case these rubber strips are missing, chances are that the bracket cover damages the car body paintwork. The rubber strip will be available per pair from stock. 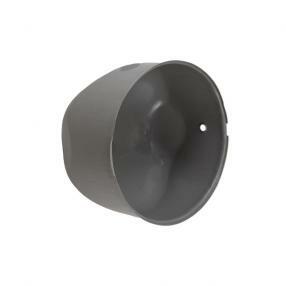 This headlight bowl with correct fit was still missing in our range of headlight bowls for our classics. From now on you can replace headlight bowls damaged by corrosion or accidents by this reproduction of quality. 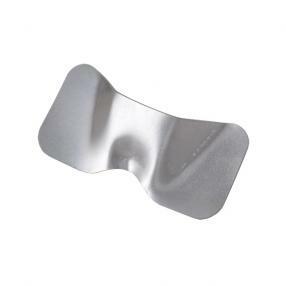 Suitable for left as well as right hand-side and available each from stock. This metal gas accelerator is installed on the floor of the drivers compartment by means of a hinge pin. This way of fixing is very subject to wear and is often damaged by corrosion because of humidity under the floor mat through leaking seals or open windows when raining. 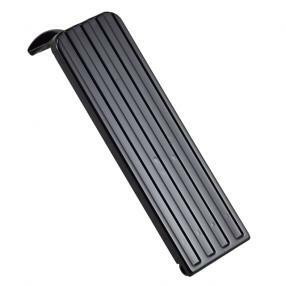 As soon as the hinge pin is damaged, there will be play and the accelerator pedal can even break off. BBT can deliver now a reproduction of quality each from stock. The access for the fuel with Type 2 08/66-07/71 is locked through a flap door that is located at the right rear side of a bus. 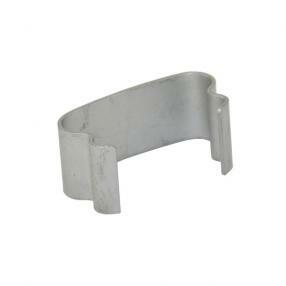 A spring clip keeps the door locked in 2 positions, but due to material fatigue or after disassembly it can get damaged. Therefore the flap door cant no longer be locked and it can open when driving and will be damaged. From now on BBT can deliver a replacement each from stock. The engine lid with Type 1 -07/67 Beetle can be locked by means of a T-level that actions a hook on a metallic support which is fixed on the inner side of the apron engine lid. After many years of duty this metallic support gets damaged or the welding came off, and the catch plate will get deformed. From now on BBT can deliver a good reproduction each from stock. The speaker grill used to be located in the middle of the dashboard as from Zwitter Type 1 model, production 10/52 till the end of production of Oval Beetle 07/57. However it was possible to install a clock instead of the speaker as an option, though the grill had to be replaced by a model with a round perforation for the assembly of the clock. 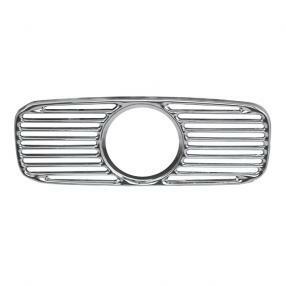 Original grills with this kind of perforation are very scarce and consequently very expensive. Thats why BBT has decided to offer an alternative in a good chromed version in own production. Available each from stock. 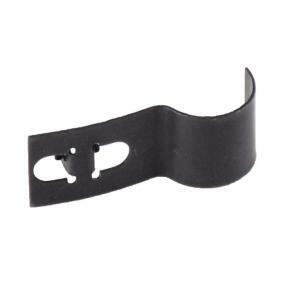 This clip keeps the wiring harness of Type 1 Beetle fixed against the inner threshold. Due to corrosion and/or disassembly of the wiring harness the clip can break off and cant be used anymore. 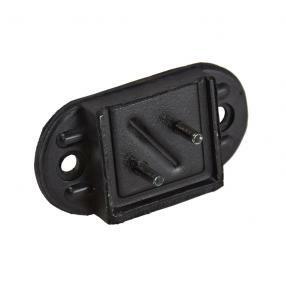 You need 3 clips for vehicles with chassis number 115 000 001-119 474780, 2 items for chassis number 119 474 781 - 110 3100 000 and as from chassis number 111 2000 001 you need again 3 clips. BBT delivers this clip each in a good reproduction. 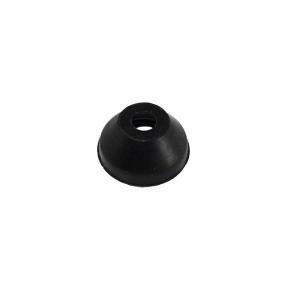 This plastic plug was originally used by Volkswagen to seal the 2 lugs above the rear bumper on both sides of the engine lid. Originally these lugs were used as access to apply the undercoating during production of the bus. These lugs were sealed by means of a plug later on the production process. When you remove these plugs they may be damaged or get lost during restoration of the bus. 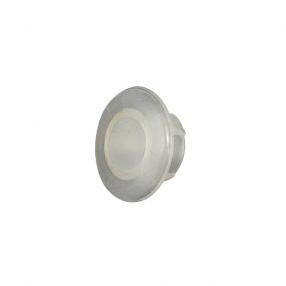 From now on BBT can deliver these plugs each from stock. November 2014 BBT acquired rubber manufacturer Fa. 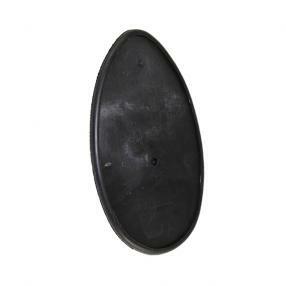 Hagen and came in possesion of many moulds to reproduce high quality rubber parts. One of these parts are the seal that fits in between the rear light support and rear wing of a Type 1 Beetle from production 08/55-07/61. 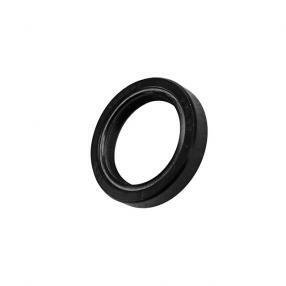 As this item now becomes available as a BBT production, the rubber quality used to produce this seal is of a high quality to ensure long lasting and durability. 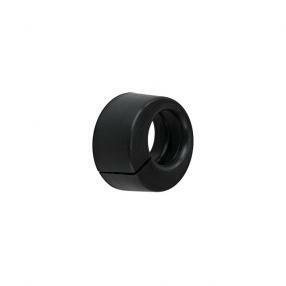 The taillight seal is available per piece and per side. The front lower windows of Type 2 -07/67 Buses can be seriously damaged under influence of corrosion occurring by a leaking windshield seal. Due to this leaking humidity gets into the surround panel and the consequences are obvious. Repair of this kind of rust isnt easy due to the profile around the surround panel. From now on, BBT has the lower window surround panel available under ref. # 0890-245. The front panel (18 cm) of windshield surround can be ordered under ref. # 0890-995. Vanagon busses (Type 25) do have a very well known rust issue which has been very specifically defined in German as "Kantenrost". This kind of rust damage can be seen at the body edges of the different body panels at Type 25 Busses. The different body panels have been welded together from the inner side while the small gap at the outer side of the car has been filled with sealer. Afterwards this sealer has been painted. After many duty years this sealer gets little cracks under influence of UV radiation, temperature fluctuations and vibrations. These little cracks allow humidity and dust to enter in between the body panel edges while from the inner side the edges weren't sealed at all. The body edges start to rust and split which even accelerates the deterioration process. The connection between the rear flank and rear wheel arches are one of the first places where this process starts. The front wheel arches get, on top of this, also damage at the entry step and connection between the wheel arch and upper wheel surrounding panel. Reproduction panel parts didn't have the correct shape and fitment while finish is even more dramatically. BBT's development department did a nice job and after more than 1 1/2 year of research and quality check they came up with a production that can compete with original quality body panels. These fine production panels are available each and per side in the well known Commitment to quality label. The hand or emergency brake is an essential part with respect to the safety of the vehicle and should always be perfectly working in case of emergency of when parking the car on inclined roads. One of the parts that get easily damaged are the brake cables. After heavy duty these cables will tear or get corroded. 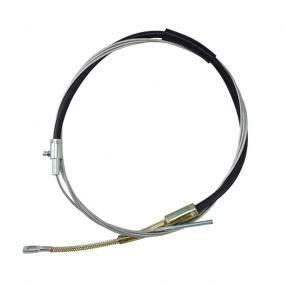 Until now the brake cable for Type 09/59-05/60 was only available on special order, but due to frequent demand weve decided to take them into our assortment. Available each from stock. The cable can be used left as well as right. Opening from a Karmann Ghia engine lid has to be done from the inner side of the car. This can be done with the use of a cable which can be controled by a button that can be found on the panel under the rear seat. 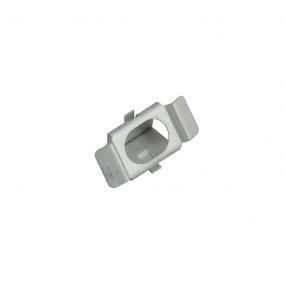 This cable goes through the rear panel and via a tube to the engine lid inner lock. In many cases, this cable can be heavily damaged or even broken so it isn't any longer possible to open the engine lid. 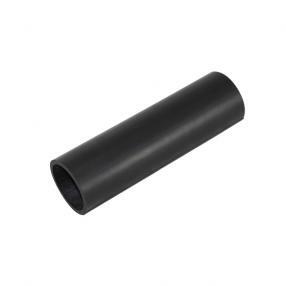 Better is to prevent problems and to replace a corroded or, due to wear, damaged cable in time. 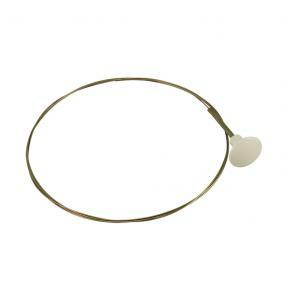 BBT already offers this cable with a black knob # 0963-250 but due to big demand we now have this cable available with a ivory white knob each from stock. A good functioning steering offers besides a safe ride also al lot of driving comfort. Proud owners of Split busses and early Bays will definitely appreciate this. 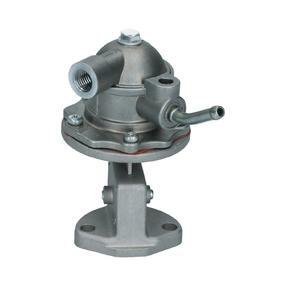 Durability of the steering box is also determined by the extent of maintenance and the use of high-quality lubricants. The oil of the steering box is good for lubrication and protection, though after a lot of use the seals that are situated at the incoming side (steering axe) and outgoing side (pitman arm), can leak whereby lube oil can escape from the steering box. A steering box without proper lubrication will get worn out much faster, causing serious consequences in respect to safety and expenses. Many fans of Type 25 buses have a weak-spot for customizing and love travelling with a lowered vehicle. 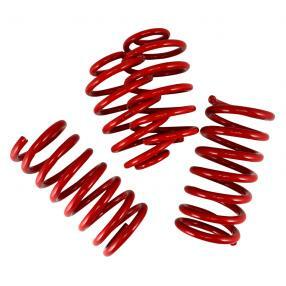 Lowering of buses shouldnt be a problem as you can do in a rather simple manner by replacing the original suspension springs through lowered springs that we present now in a set from stock. This seal is located at the nose of the gear box with Type 1 Beetle till production 09/52 and Type 2 bus till 04/59. It makes that the gear box is duly placed on the chassis and the seals will buff mechanical vibrations of transmission and engine. After more than 50 years of duty these seals are often hardened and ripped partly due to leaking gear box oil. From now on BBT can deliver a good reproduction each from stock. Decent suspension from the drivetrain on our Classic Volkswagen is extremely important to offer comfortable and safe driving. The 3 silentblocs that keep gearbox and engine on their place are one of the important parts to keep gearbox and engine in their position, a torn silentbloc will cause the drivetrain to vibrate excessively and these vibrations might cause damage to drive shafts and gear selection. A due to oil contaminated or torn silentbloc must be replaced to prevent worse. 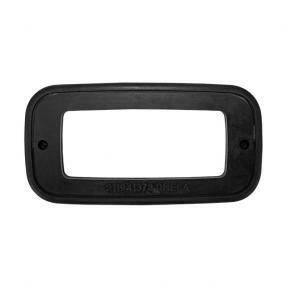 BBT can offer the front silentbloc each from stock under #1485-11 while the rear silentblocs can be replaced with #1481-100. Back-up lights for buses were only available under option code M47 from production Type 2 08/66-. It was executed by means of a perforation on the panel above the taillights and within these perforations 2 reverse lights were installed. After many years of service the seal is often hardened. The seal allows also to add back-up lights on a bus in an esthetical way. From now on the seal is available each from stock in a high-quality reproduction. 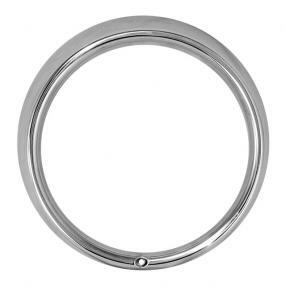 Frequent demands for a good alternative of chromed headlight rim BBT # 0604 has incited the BBT purchase team to look for a better part in stainless steel that has a nice look and even more important the correct fit. 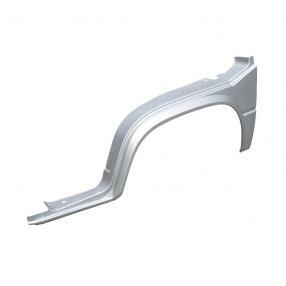 n collaboration between Flat 4 and BBT we present from now on the headlight rim in stainless steel each from stock.